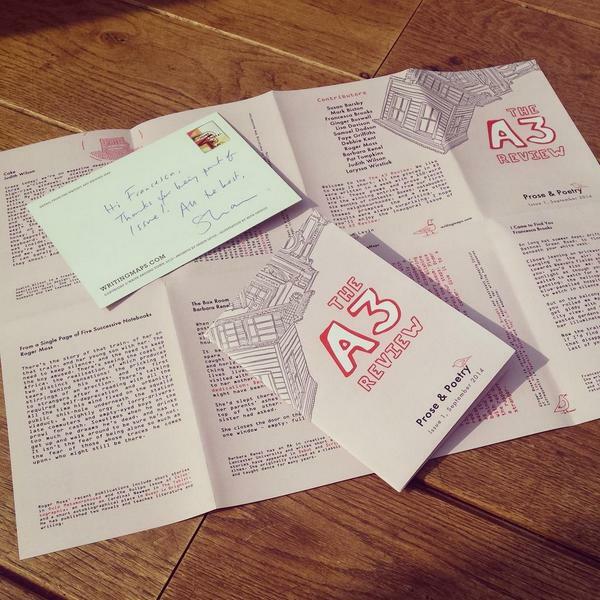 This morning the A3 Review finally slipped through my letterbox to land in my eager, outstretched arms. The Review, which is the size of a concertina postcard, folds out to become an A3 map of short stories fizzing with energy, lyrical prose and poetic fragments. It also occurred to me today (when I insisted that all of my family needed to read the story aloud and to catch hold of the right rhythm) that I am doing things with sound, and with a kind of aural, vocal sculpting, in my own writing which I am also interested in in my academic research. I will talk a little more about this in some posts over the next couple of weeks, but it is something of a newly dawning revelation. It never crossed my mind that the two things might overlap before. Writing Maps, who produced the journal, also make beautifully designed maps and prompts to inspire writing in all kinds of unlikely and lovely places (from the beach, to a local cafe and the city streets), and they will soon be starting up their monthly short fiction competitions again in the search for new material for the next Review. So have a little browse of their website, sign up to the mailing list and submit to their upcoming prompts!